Hope. This was a theme challenge given to me by my friend Beth for her JDRF silent auction. I so enjoyed working with a theme in mind. (Those who know me well, know that I love themes!) I really stretched my creativity this time and decided to do some mixed media on canvas (above). It was great fun as I first covered the canvas in alcohol inks, then added layers of paper and fabric. I love how it turned out. The other piece I did is more in line with what usually do...a distressed ink look in amber and black. I did add a bit of shimmer to the flowers (a shimmer of hope) but you can't tell from the photos. I've been finding some time to work on my mixed media art and I'm having a blast just creating anything that comes to mind. My sister taught me how to make collage paper out of fabric and alcohol ink and as you can see, I've been experimenting like crazy. I enjoy the art, but I also enjoy sharing it. For the past three years, I've been donating a piece of furniture art to the Severna Park Mom's Group, an organization that raises money for various charities and causes. This year, my friend Beth is heading up the Juvenile Diabetes Research Foundation Annual Gala in Pittsburgh. She asked for a contribution and I'm working on it. Originally, she liked the two pieces that I show here, but then asked me if I could create something with the theme of "Hope." Of course my wheels started turning, and I'm working on it right now! It's fun to give back -- it's not only good for business, it's good for the soul. NOTE: THE APPLE MOBILE ME NETWORK IS HAVING SOME TECHNICAL DIFFICULTIES AND MY WEBSITE MAY OR MAY NOT APPEAR IN ITS ENTIRETY WHEN YOU CLICK ON THE PHOTO TO THE RIGHT. APPLE SAYS THAT THEY WILL TRY TO RESOLVE THIS IN TWO WEEKS (UGH)! In the meantime, if you click on it a few times, you will eventually see parts of my website. UGH! Once again, after sanding, priming, painstakingly painting and adding a protective coating to a project (a bookcase this time), I returned to the warehouse to find out that the polywhey coating I used has yellowed the surface. So, instead of baby-blue and white bookcases, I have a dirty white and barely blue bookcase. I had this problem before with my dragonfly mirror and I wrote the company, Vermont Natural Coatings. The company was very concerned, helpful and understanding. They even sent me a new batch (along with a complimentary bottle of Vermont syrup) and assured me that it wouldn't happen again. So, I coated my beachy chairs with the new stuff and they looked fantastic. After that, I didn't hesitate to coat the bookshelves. It looked fine until it dried. The only thing I can think of is that the color of the paint must have something to do with it...everything that I coat that has a light color turns yellow. I'm so frustrated and feel bad because I can't reccomend this product for light-colored, hand-painted objects even though they are environmentally friendly and were very customer-friendly. I can, however, recommend it for coating plain wood and dark painted objects. So, I've been busy re-sanding and re-sanding. If anyone has any suggestions as to what type of protective coating to use, please send them along!!! On a good note, I finished this whimsical mirror (above) that I think it would be at home in a country style foyer or a little girl's room. It was relatively easy to complete. After sanding and priming, I painted the frame and hand-painted some wood cutouts from the craft store. Then I glued them on with something called "Liquid Fusion." The wood glue that I was using worked well, however it dried an ugly dark yellow (what's with this yellowing stuff?) and if it seeped out, it took away from the finished piece. Finally, back to a somewhat normal schedule. I do plan on blogging at least twice a week unless I have something super cool to share (and then I just can't wait!). I haven't been as crazy crafty because I have actual work to do (work that pays me). I did make it to the warehouse yesterday and finally finished my cool little table...yea!! Now on to the chairs! I made this collage (above) last week and finally framed it with two others. I particularly love this one because I love the ocean, love the color blue and sea glass...see the tiny piece I incorporated? Today in the mail, I received some really cool inks that I ordered online... I can't wait to use them! But, I'll have to wait...I'm going to be spending my weekend (starting this afternoon) in a smelly gym with all of the county high school wrestlers (including my son). Our high school is hosting this huge event and I'm helping in the coaches' hospitality room when I'm not watching my son wrestle. Not much time to craft, but a lot of time to think up new projects. I'll bring my sketchbook! Happy Valentine's Day! Don't expect me to keep posting like this all the time. It's just that I've been trapped inside my house for so long because of the snow that I'm finding too many things to do! You can only clean out your closets, do laundry, read, bake and play family games so much. So, I can't help being productive in a crafty sort of way. Instead of making things to sell, I decided to create some things for my own home. Right now, I have a few projects going on. I framed some photos; I'm making a welcome sign for my hall; and I decided to create some fun light-switch covers. My sister's friend Allison gave me the idea. She sells some really cool ones online at her etsy shop. http://www.etsy.com/shop/allisonpapercrafts. I'm not exactly sure how she makes hers, but I use a variety of things such as fabric, papers, paint markers and good old fashioned Mod Podge. I went a little crazy. I love to make Valentines...I've made them for years for my boys and Greg. Through the years, they have become a little more sophisticated, but they remain heartfelt (get it?). In the above examples, I used pieces of paper cut from an alcohol ink collage created by my niece, Maddie. The colors are so rich and saturated that I was drawn to them immediately. 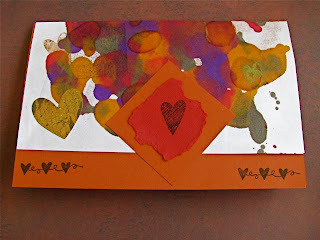 I then used stamps with distressed inks to form some of the hearts and I cut them out and glued them on squares or ripped paper. The other Valentine, to my left, is one I created with a textured paper...it reminded me of my eldest son, so I just used him for inspiration. 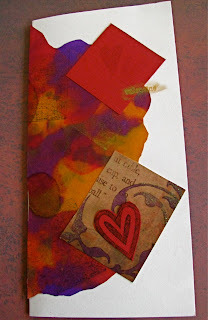 After I cut out a traditional red heart, I used stamps to embellish the rest of the card, along with embossing powder. It was a lot of fun experimenting and making these. Give it a try! It's something you can do with your crafty kids, too. I made these with my niece and she made Valentine's for all the girls in her class... "the boys just wouldn't appreciate it." Well, I hope my boys appreciate these, but they've grown accustomed to homemade Valentines from mom (including the heart-shaped cookies). I'd love to see some of your creations, so please share them and get busy...Valentine's Day is Sunday!!!!!! Being "snowed in" is a great excuse for staying in bed and reading and that's exactly what I did yesterday and today. If this snow keeps up, I may even read two books in three weeks...unheard of, unless I'm on vacation. What am I reading? Well, right now, I'm supposed to be reading "The Help" for book club, but the fact is, I can't put down a book, called "The Unlikely Disciple" by Kevin Roose. It's a book by a Brown student who actually goes undercover for a semester at Liberty University -- one of the largest evangelical Christian universities in the world. It's extremely well-written and I think the reason I am identifying with it so much is because my son is currently attending another Christian school up North. I also know a friend's son who is currently attending Liberty. Here's the website if you're interested: www.kevinroose.com. Lest you think I sit in bed reading and eating bon-bons all day, I've been unbelievably productive framing some of my mixed media collages...I really wish that I could take some better photos to share with you, but alas, the ones you see are the ones I have. I will be putting them on my website for sale as soon as I can get some decent photographs of them. The one above is an actual photograph of a reflection in the water (untouched by any photo editing program). I just loved the colors and to me it looks like a water color (well, it is in a way, isn't it?). I used some scrapbook materials I have to turn it into a mixed media piece. The other piece (to the left) is a piece I created at my sister's house using various items such as vintage jewelry, twine and pieces of an antique book. It says "vision," but, to reiterate, my photography isn't the best, so it's kind of tough to see. Let me know what you think. It's still snowing! We have a record snowfall here. Spending most of my time inside cooking (in case the power goes out, I'll be able to hook up a crock pot to the generator). Above is the view out my front door...took a while to get the door open so we could shovel a path. However, as soon as we shoveled it, it was covered again and I mean covered with at least two inches!!! If I had to guess, I would say we have at least 30 inches so far...with the drifts, it's up past my waist in some areas, making it quite hard to move! Stoli, my Siberian husky, is enjoying it, but she got a little spooked when she sunk into snow above her head! She quickly scrambled out and found solace under a tree where the snow had drifted away. My neighbor came by with a snow blower and did a good part of the driveway in case we have to get out (of course, we really can't go anywhere since the streets aren't all plowed)! Well, better get back to that Italian wedding soup (nothing like homemade soup on a day like today!) and probably some crafting or painting. Well, here I sit, back in my humble abode watching the snow fall ... apparently there's 28 inches on the way. Of course, the kids are being dismissed early... I honestly don't think we've had a full week of school for the past month and a half! It was wonderful being at my sister's house this past weekend, even though the circumstances weren't ideal. I had a chance to really think through things and find a new creative outlet...mixed media collage. 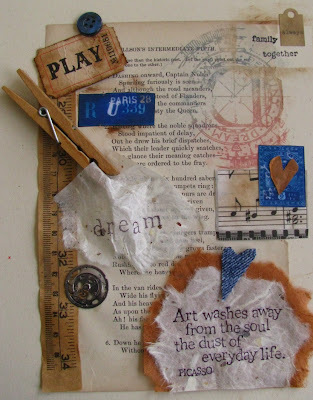 Mixed media collage encompasses everything and anything...you can play with paints, inks, stamps, paper, tissue, markers, photos, and more! I am trying to include some of my photography in my creations, along with some vintage jewelry and metal, and of course, my favorite...ripped paper. Just take a look at some of the fun pieces I've done in the past few days (shown above). I think I've found a new artistic direction!! This isn't to say that I've given up on my furniture painting...I was painting today, finishing this darling little table and chair set. It's just really hard work and at this point, I have only a few finished pieces and tons of projects just waiting for some tender loving care. The collage art gives me a sort of immediate gratification ... an actual finished project. Unlike the furniture painting, I really don't plan anything when I start, except maybe the size of my piece. Then I just start placing things randomly until I find a design or color direction that I like. After that, I begin adding texture with jewelry, buttons, pieces of twine, paper and even watch parts. Sometimes I try to glue at least two things in place and see where it takes me; other times I just move things around until I create an eye-pleasing design. Either way, it's very liberating and exciting. Do you have an artistic outlet? Let me know! Here I am at my sister's house and it's been a roller coaster weekend. My nephew, Ryan, was admitted to the hospital on Friday with severe pains...appendicitis! To top it off, he already has mono, which is making his recovery time a lot longer. My sister's husband is halfway across the world in Australia, so, long story short, I drove up to take care of my seven-year old niece while sis was at the hospital with Ryan. While doing my sister a favor, I actually did a favor for myself ... I got to explore my creativity (see above)! I created this cool collage for my kitchen and another one that's in the process of drying right now. I've had a great time with my niece...we went out to dinner on Friday, did make-up and hair together on Saturday, dressed up as spies, watched movies, made up a dance routine, and played in my sister's jewelry room with a plethora of crafts! I was like a monkey in a banana tree! My sister has so many craft supplies that she could open her own store! 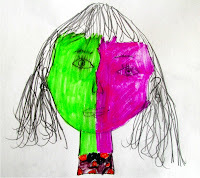 My niece, Maddie, even drew a portrait of me, Picasso-style (see picture on right). I also got to create some valentine's for the men in my life while Maddie made valentines for all of the girls in her second grade class. I'll share those creations with you a little closer to Valentine's Day! My sister finally came home with my nephew late yesterday afternoon (he's doing much better) and I cooked up some of my famous Italian wedding soup for her and her family. We are enjoying our time together so much, I even talked my husband into letting me stay up here a bit longer...I've got to offer that morale support! Stacie spent the day making jewelry (check her stuff out at www.etsy.com/shop/staciejewelry ) and I spent the day crafting! Tonight we're going to watch a movie and relax and tomorrow, I have to go back to the real world. Ryan, by the way, is sleeping a lot.